The mining town of Zouérat in northern Mauritania is one such isolated outpost. With a population close to fifty thousand, Zouérat is not a small town either. 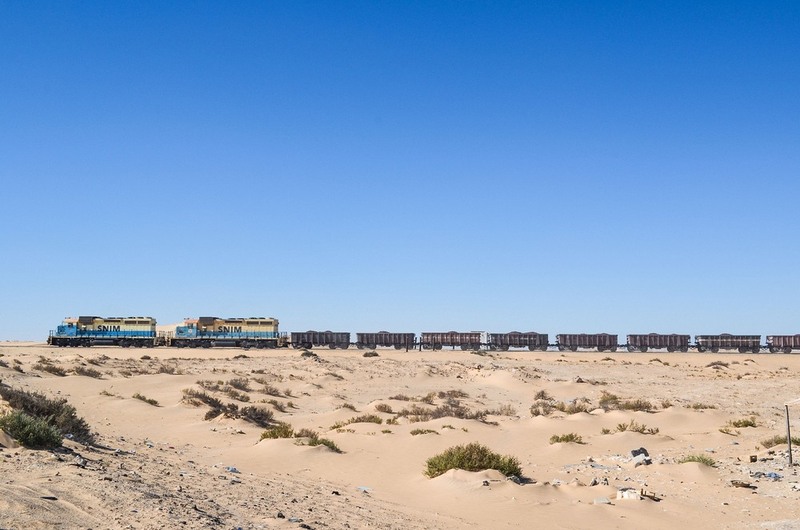 Yet, Zouérat’s only connection to the city of Nouadhibou, the country’s only major shipping port on the Atlantic coast, is via a railway. 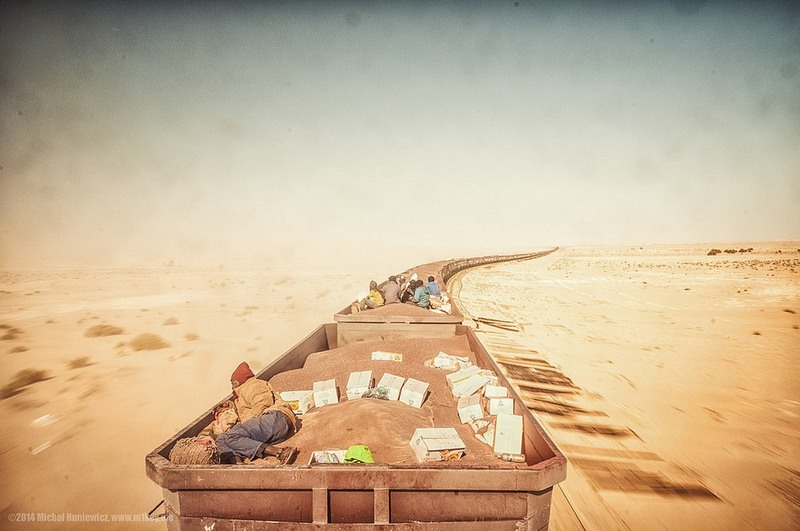 This railway, the only one in the country, serves as the lifeline for one of the world’s poorest nations, hauling iron ore from the mines at Zouérat to the port city of Nouadhibou to be shipped to China and Japan, as well as to Switzerland, Spain, France, Italy and Germany. 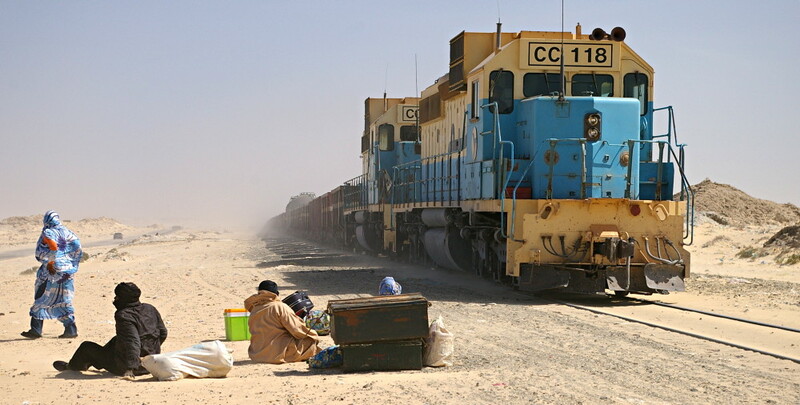 This railway not only helps drive half the economy of Mauritania, it is also the sole connection to the outside world for the people who live along its route. 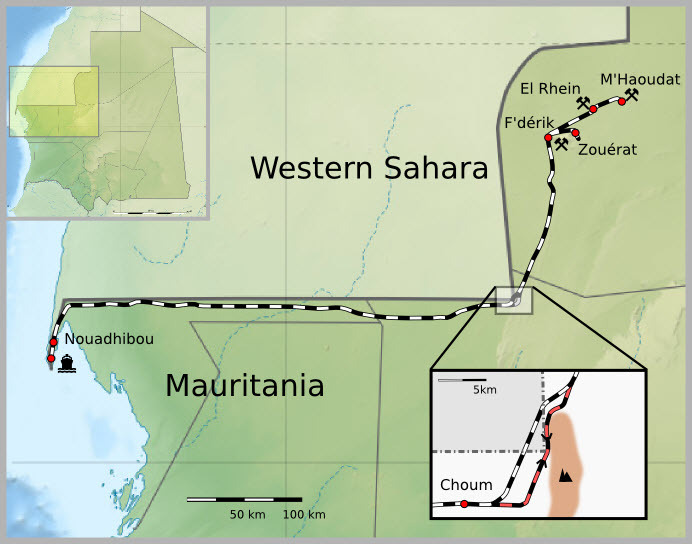 The Mauritania Railway was opened in 1963, ten years after iron ore was discovered near Kediet ej Jill, Mauritania’s highest mountain. 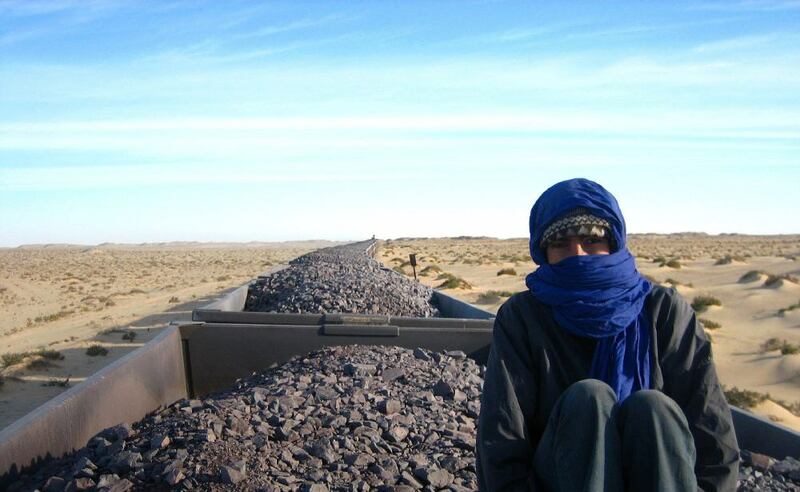 A mining center was constructed at Zouerate together with port facilities at Nouadhibou on the Atlantic coast, and both centers were linked by a railway line 700 km long. Over the decades as the industry evolved, many new iron ore deposits were discovered in the region and half a dozen or so communities sprang up along the railway tracks. For the people living in these settlements, the train is their only link to civilization. Every evening, a long train hauling iron ore leaves Zouérat for Nouadhibou, dragging as many as two hundred wagons brimming with hematite. The train stretches for 2.5 kilometers. 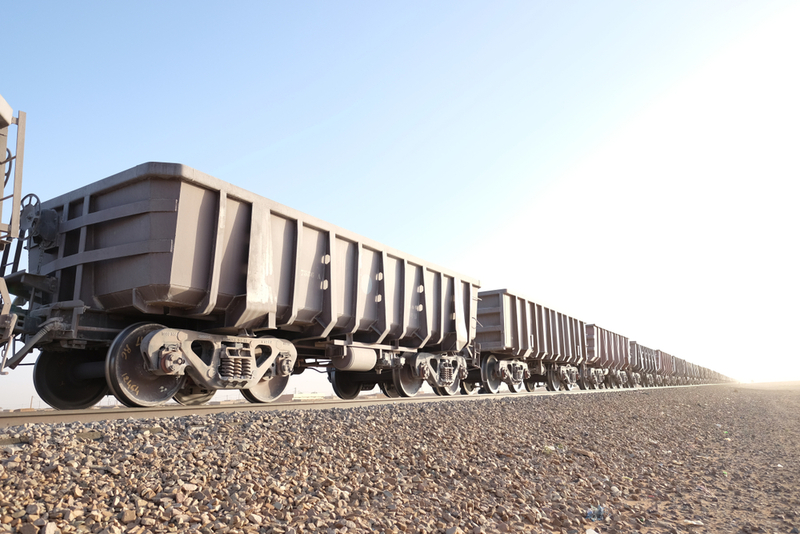 Each wagon carries up to 84 tons of iron ore, making the train one of the heaviest and longest in the world. A couple of passenger cars are also pulled along, but many prefer to hop into the wagons instead atop the pile of iron ore, trading comfort for a free ride. The journey is long and miserable. The iron ore is like fine sand that gets constantly blown in the face. The ore dust gets into every orifice in the body, and penetrates the clothing until everything is stained a rusty red hue. The open-air top provides no respite from the scorching heat of the day and the frigid air of the night. Blankets are a must. Some passengers dig small holes in the iron ore pile and build stoves, burning charcoal to make tea. 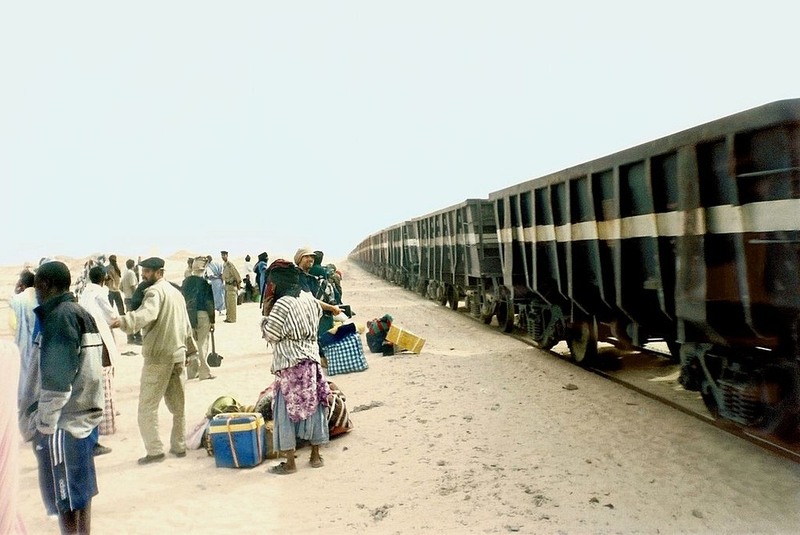 After a 17-hour-long arduous journey, the train arrives at Nouadhibou, where the ore-blackened passengers climb down from their perches and unload their cargo. The train then continues on to the harbor to dump the 22,000 tons of ore. Three hours later, the train is back at Nouadhibou’s station for the return trip. This time the wagons are empty, which makes the outbound journey slightly more bearable. During the 15-minute stop, there is a rush to load the wagons with cargo, because the train doesn’t wait for the passengers to finish loading. Those who do not work fast enough are left behind. Goats, donkeys and camels are hoisted onto the empty wagons. Cartons of apples and oranges, bottles of water are stacked meters high. Mattresses, building supplies, satellite dishes—anything the remote towns need. The train crawls through the desert, travelling at no more than 50 kilometers per hour. When it passes through towns it slows down allowing passengers to disembark and others to hop aboard. Some men take this opportunity to jump out, relieve themselves and race back before the train speeds up again. For those who can afford to spare $3 for a ticket, the journey isn’t anymore comfortable. But at least the passengers have a working toilet. Those who are interested, Washington Post published a nice photo essay on the journey a few years back.